The Japan Foundation launched the Minna no Kyôzai Japanese version in May 2002 and the English version in November 2004. The Japan Foundation is aiming to help Japanese-language teachers from all over the world produce teaching materials that are suited to every local learner. This app allows you to learn kanji in a fun way using mnemonic pictures and games. This site lets Japanese language learners study the language by reading information articles on 12 topics that they may be interested, watching videos of people talking in Japanese, and exchanging comments with other users. New articles will be frequently posted. JF Japanese e-Learning Minato is a Japanese language learning platform provided by the Japan Foundation. Users can take online courses to learn Japanese and interact with worldwide communities of like-minded people. HIRAGANA Memory Hint and KATAKANA Memory Hint are apps that allow you to learn hiragana and katakana in a fun way using mnemonic pictures. They include plenty of quizzes for you to test your understanding. MARUGOTO+ (MARUGOTO Plus) is a website where users can learn about Japanese language and culture based on the contents of the “MARUGOTO: Japanese Language and Culture,” the official coursebook of the Japan Foundation, which complies with the JF Standard for Japanese-Language Education. Japanese anime and manga are really popular with young people all over the world today. 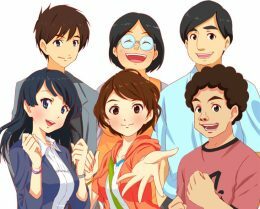 This is an e-learning website for those who want to learn Japanese from anime and manga. Users can study expression distinctive of characters with audio playback or words used in a specific genre, such as LOVE, through quizzes. It’s a fun way to learn Japanese! It’s a radio program of Japanese language lessons, and one great feature is that you can learn Japanese in 17 different languages, including Hindi, Bengali, Urdu, and of course, English.